A New Year always brings new resolutions, right? Well, one of mine is to recognize the importance of a well-balanced diet. After the holidays and many, many over indulgent meals, I needed a slight break from the heavy dishes. Most of the time, I'm up for trying new things (that's on my resolution list, too), but when it comes to odd ingredients for a smoothie, I tend to be a little hesitant. Let's just say I'm typically your pina colada kind of girl, so I knew I had to find a smoothie with ingredients I already know and love. After searching through many different recipe websites, I finally decided to combine a few favorites. 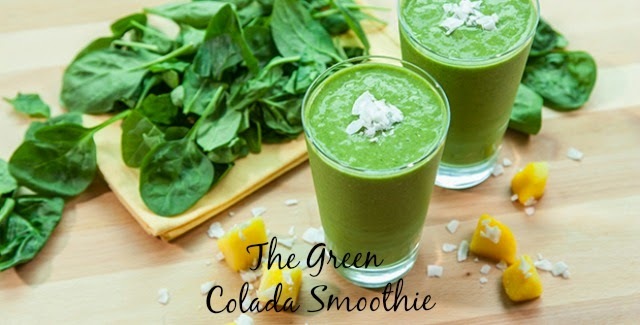 Here is the simple recipe to my new go-to green smoothie. Simply add all ingredients into blender and blend until smooth - enjoy! That actually sounds really good. I love spinach smoothies! I feel healthier just reading this post!